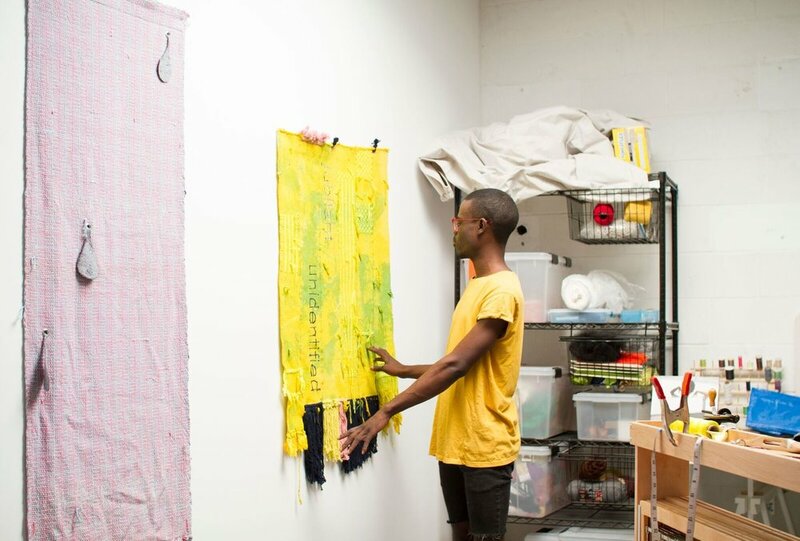 Diedrick Brackens’ artistic practice at the loom weaves together a dialogue of opposition, complement, and complexity. Sewing his personal identity as a queer black man in America with a broader historical context, Bracken’s pieces embody a narrative often untold and are currently on exhibit at the Hammer Museum until September 2nd. Brackens pull imagery for his fabrics from real historical events to speak to a larger narrative, binding his current practice with imagery of the past. These compositions begin as sketches, which he then translates into woven images. Some illustrations are directly pulled from specific events and often reference Brackens’ Southern identity, as a native to the Dallas area. Brackens overtly addresses Southern identity in some pieces such as on where he used brutal imagery depicted from an old lynching photograph from Waco, Texas. 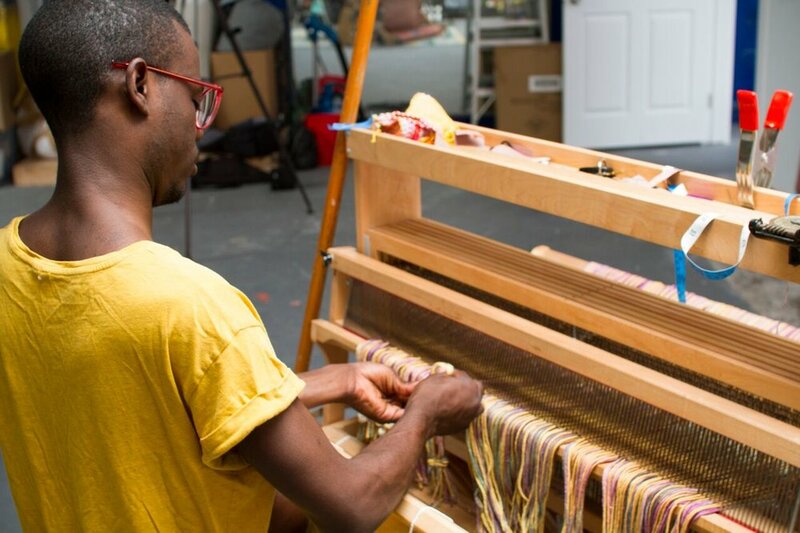 Other times the south is evoked through techniques like regionally-specific knotting, weaving, and quilting, while other pieces are primarily improvisational with materials woven in or onto the piece as he goes. With such personal investment in each piece, Brackens admits it’s often challenging to produce the right language in his practice in terms of integrating text into the actual tapestry. He thus finds text most important when choosing a title. Brackens’ titles directly address the narratives he incorporates into a piece, serving as an anchor or reference point, especially in more abstract work. 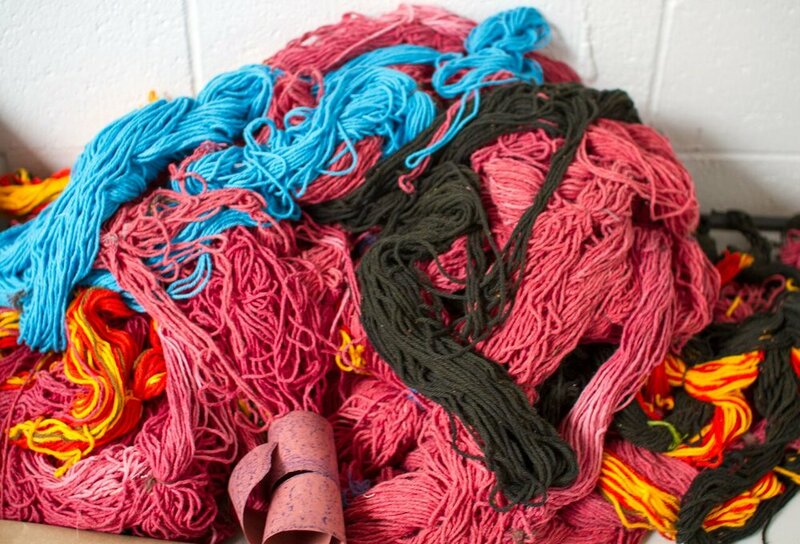 Brackens likens his process as a sort of time travel in which he utilizes the art of textiles to bind together elements of fabric and yarn into a conversation about the past while also addressing the present. Extensive knowledge of the craft allows Brackens’ to incorporate specific techniques from certain eras to add to the pieces conceptual depth. Whether the viewer is aware or not, Brackens’ work indexes time informed by patterns and weaving techniques to evoke stories and conversations deeply rooted in history. The integration of certain materials allows Brackens to collage various bits of history next to each other, introducing new conversation. For example, he has been known to integrate elements of the fabled Underground Railroad Quilt Code, a series of symbols supposedly used to signal safety or danger for a slave on the road to freedom into his work. In conjunction with pattern, color is just as important when it comes to symbolism in Brackens’ work. Techniques such as mixing pink and blue thread to create purple and the juxtaposition of certain hues have the power to create a vibration and sense of urgency. Brackens finds that falling in love with the materials and medium is similar, in process, to engendering conversations of race, gender, and history in art. “Whatever the product is, I’m not doing anything new,” Brackens explains. 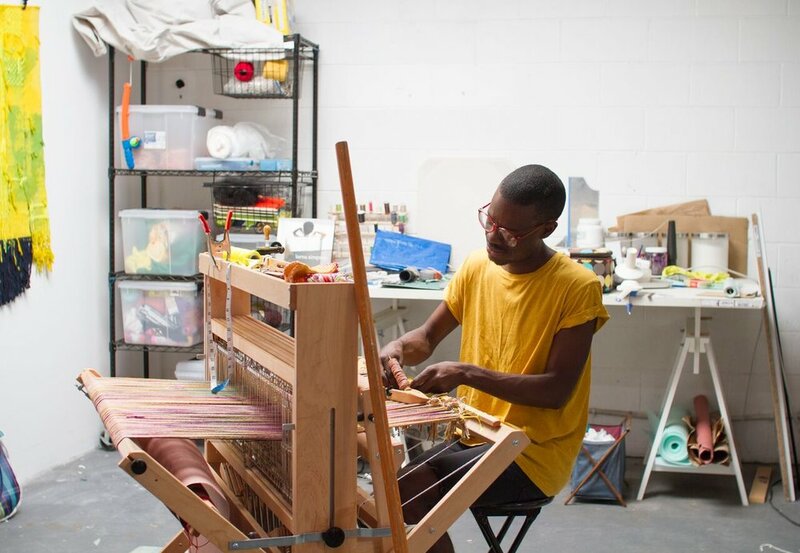 “It feels like the only way to give back to that time.” Brackens’ ability to speak through his textiles is not only a gift to the time of the past, but also to the present.